THE EUROPEAN PARLIAMENT has approved changes to the number of MEPs each country will elect next year – meaning Ireland is set to lose one seat, from 12 to 11. 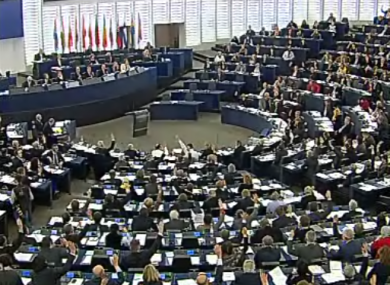 MEPs in Strasbourg for the parliament’s monthly plenary session voted by 536 to 111, with 44 abstentions, to approve the reallocation of seats following the elections next June. The parliament currently has 754 MEPs, distributed between all 27 member states, but the entry of Croatia into the union this year – combined with the implementation of parts of the Lisbon Treaty, which limit the membership to 751 – means some countries must lose seats. 11 of Ireland’s 12 current MEPs were among those to vote against the measure. Fianna Fáil’s Brian Crowley was absent. A chart shows the outcome of today’s vote in Strasbourg. A seating plan showing the seat of each MEP can be found here. Fine Gael MEP Gay Mitchell made a last-ditch attempt to stop the matter from being put to a vote today, saying the Constitutional Affairs Committee – which had formulated the proposals – had not taken any independent input. The Dublin MEP complained that Ireland had already lost one fifth of its representation in the parliament, having been gradually cut from 15 seats to 12, and that a further cut to 11 hit Ireland disproportionately hard. Mitchell was able to force a vote on whether to refer the matter back to that committee, for further input to be sought, but his proposal was comprehensively defeated. Speaking in advance of the vote, Fianna Fáil’s Pat the Cope Gallagher said he was “totally against” the reduction, which left Ireland’s workload “unmanageable”. “We have 11 MEPs to straddle over 20 committees in the parliament, and it’s not possible to do that,” he said. “It doesn’t seem fair for a country for a country like Ireland, with a population of 4.5 million, to have just 11 MEPs when we have countries with more MEPs who have a similar population,” he said. The measures are not guaranteed to take effect, as they must first be approved by the Council of ministers. A decision at that level is expected in the coming weeks. Email “European Parliament approves plan to cut Ireland from 12 MEPs to 11”. Feedback on “European Parliament approves plan to cut Ireland from 12 MEPs to 11”.